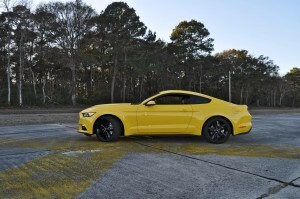 There are a few occupational hazards in writing car reviews. 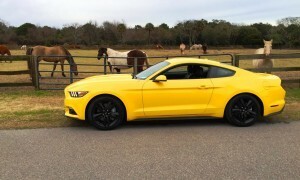 The most serious risk of all? 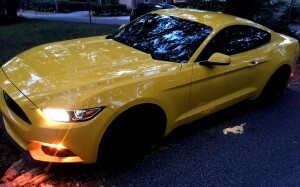 Falling in love with a press loaner. 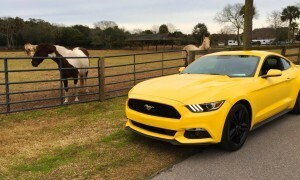 You spend the first day shocked by your good fortune and impressive networking to have this sweet ride parked in your driveway. 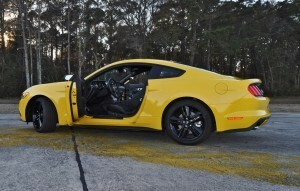 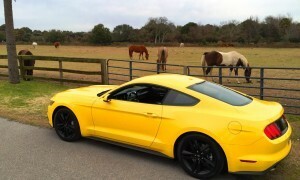 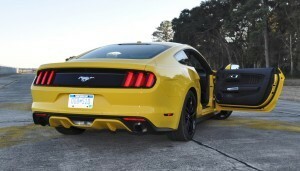 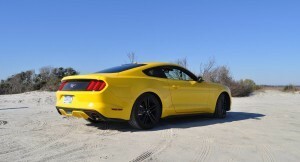 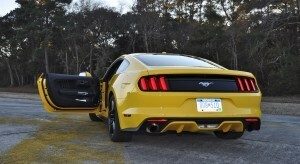 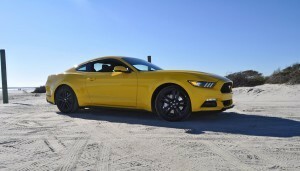 Just seeing the Mustang outside on its gorgeous black 19-inch wheels was a huge rush. Day two is about being smitten with surprise and delight features while driving. 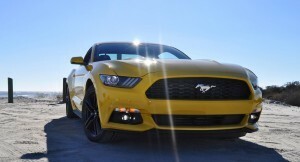 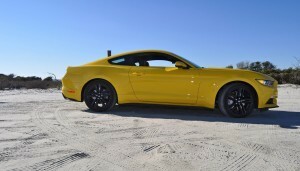 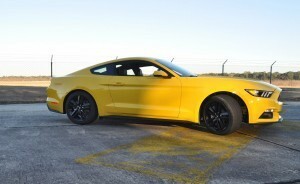 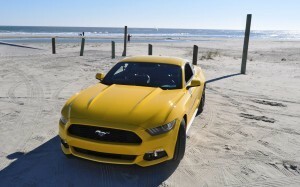 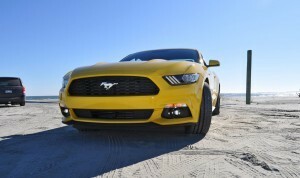 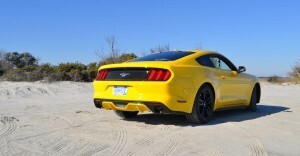 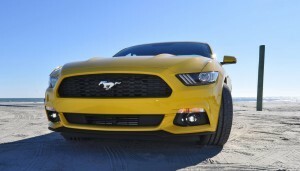 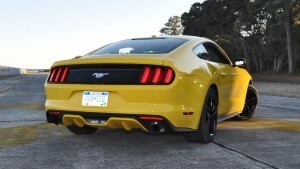 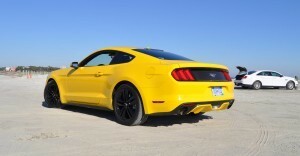 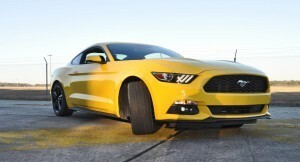 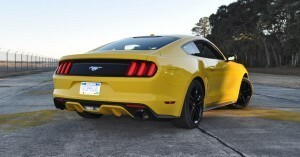 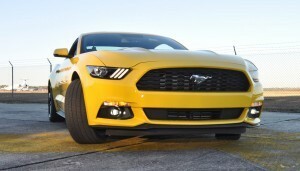 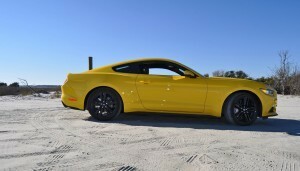 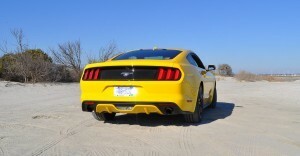 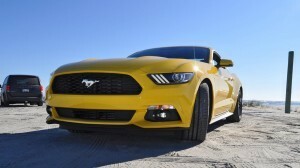 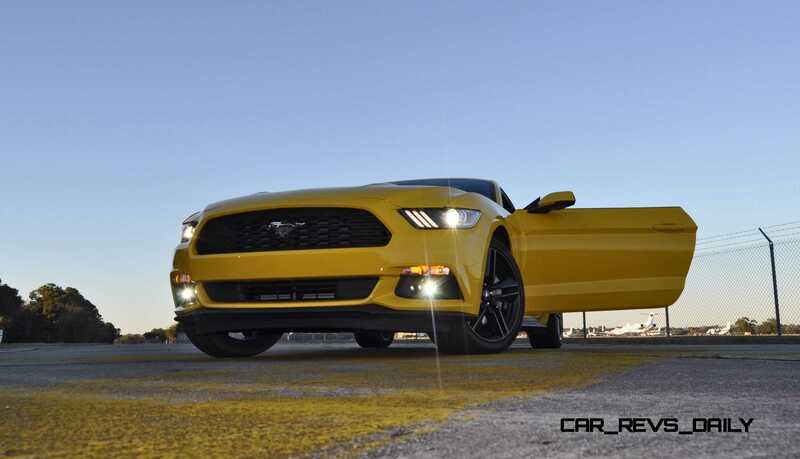 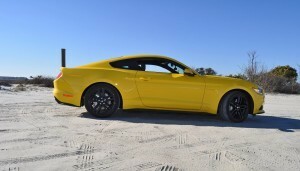 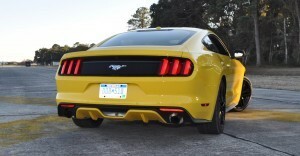 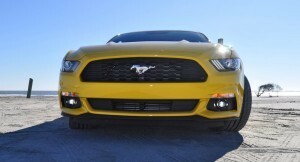 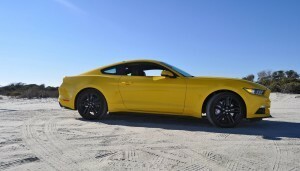 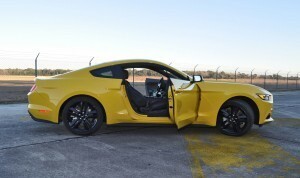 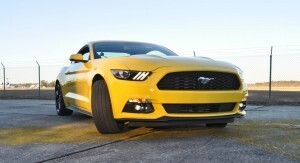 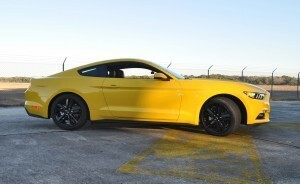 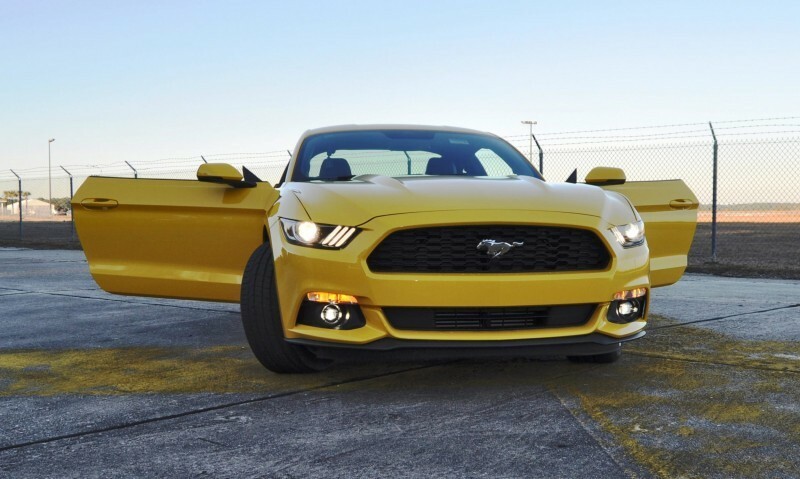 The Mustang rewards with an amazing driving position, fantastic rear-drive dynamics and Track mode. 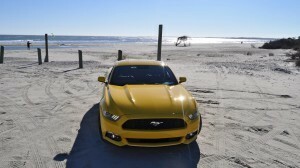 See the summary for the end-of-week thoughts. 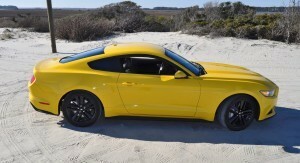 But here’s a spoiler: it involves deep regret, melancholy that the car is going back, and thoughts about what you could have done in your time together! 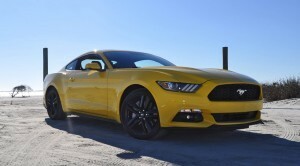 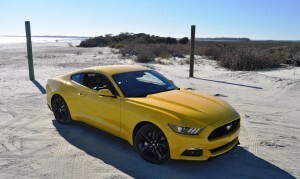 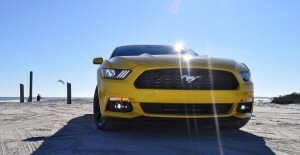 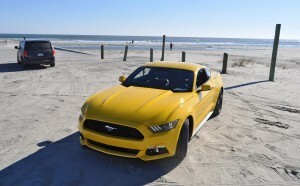 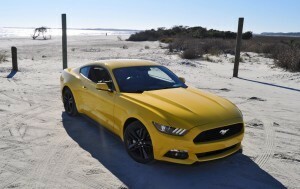 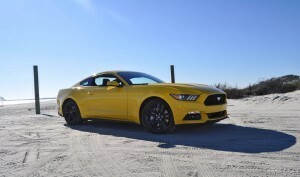 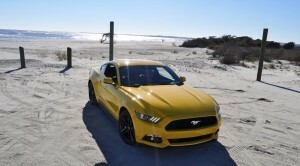 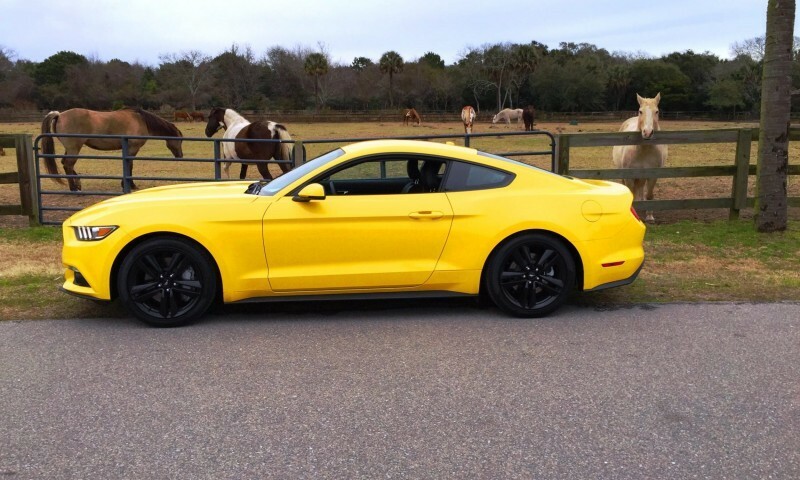 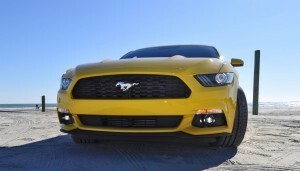 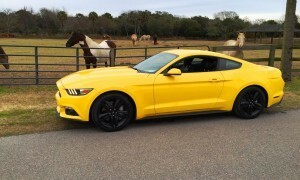 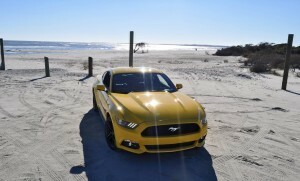 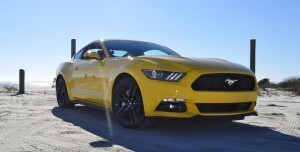 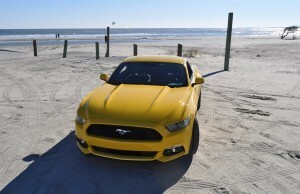 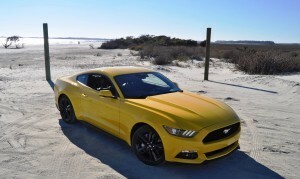 The 2015 Ford Mustang was a warm ray of sunshine this winter — with its boost hiss still warming the heart on this chilly March day. 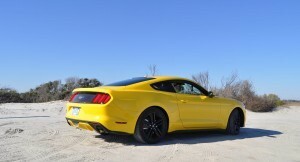 Enjoy the HD drive videos below, 250 new photos and comprehensive drive impressions below. 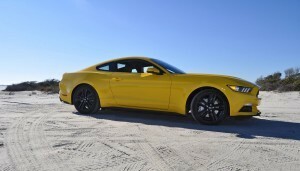 The big news with the 2015 Mustang is clear to see outside. A design that in memory seems very similar to the 2014 car, but in the flesh feels ultra-modern, clean and incredibly stylish. 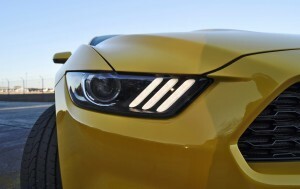 The biggest clue first-off to the Mustang’s new-ness are its three vertical LED slashes inside each headlamp, matching the angle of the giant grille. 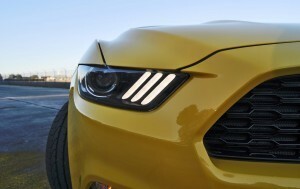 In the nose, the details we came to love best were the dominant grille shape, feeling low and wide and pushing all the lighting to the very edges of the car’s face. 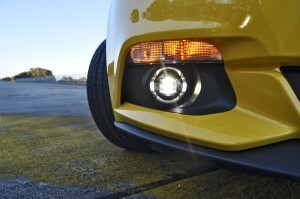 The twin hood strakes are aggressive outside and in: you see them at all times while driving. 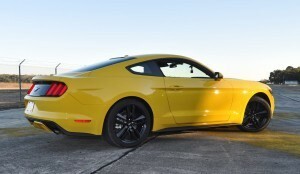 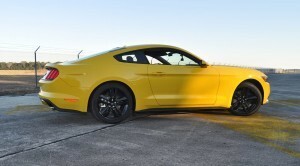 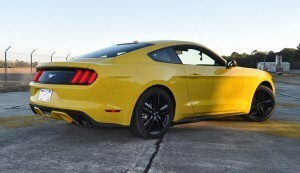 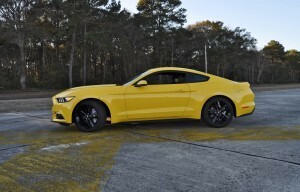 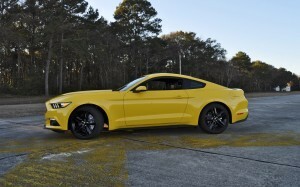 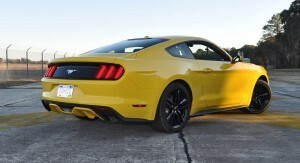 The profile of the Mustang EcoBoost is one of its top three angles. =] The low and long hood feels instantly like a muscle-car, while the flowing rear glasshouse and roofline are almost perfect matches for that long-nose hood. 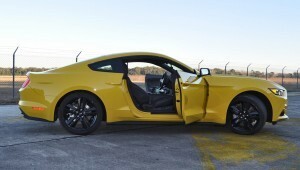 In the doors and glasshouse, the Mustang is not trying too hard to impress. 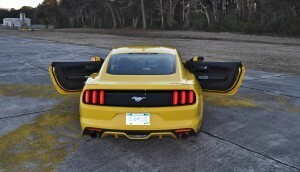 It is just cool. 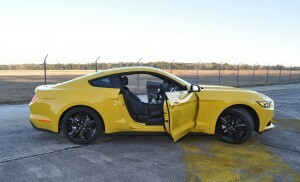 Lightly tinted glass is uninterrupted between the frameless doors and the rear three-quarter window. 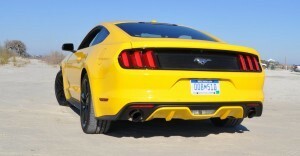 It is a leaned-back and cool shape. 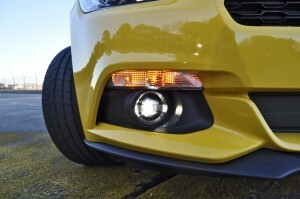 A simple beltline accent flows from the nose along the height of the door handles, extending into the trunk-sides as well. 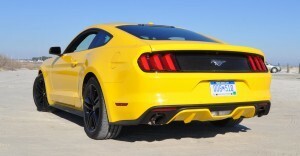 Our overall favorite profile design detail is the lower sill. 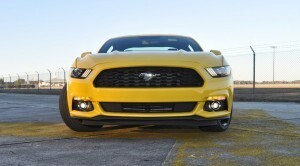 This is a shrink-wrapped bar of reinforced steel that extends downward to meet the wheels front and back. 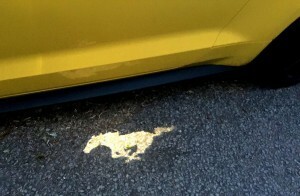 Lovely. 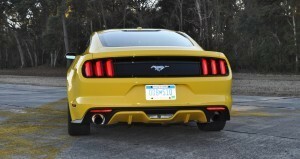 The tail again is a heavenly sight. 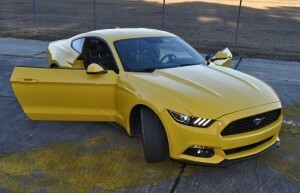 It seems perfect. 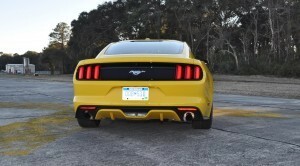 The new three-pack of slim vertical LED lamps are the highlight, living in a gloss-black trunk section that makes the body designs pop and the color-matched lower diffuser stand out extra nicely. 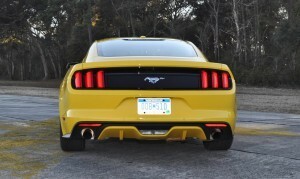 Twin exhaust pipes are a feature of all engines, with the lack of a GT badge in between the lamps the only indication of engine. 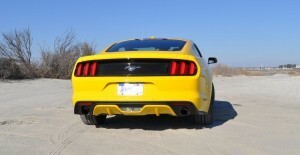 This test car had the factory-delete option of its rear spoiler selected. 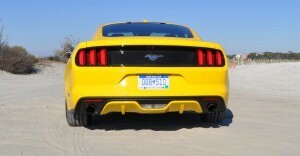 A slight flip in the tail’s beveled edge still feels like a functional aero element even without a wing. 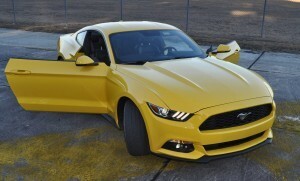 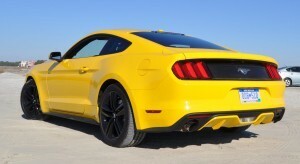 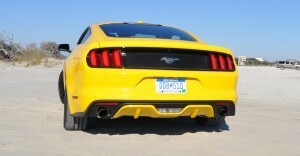 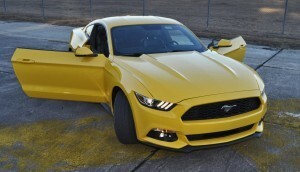 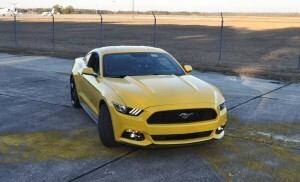 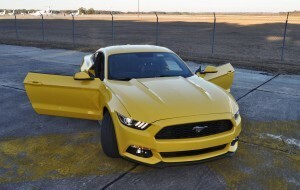 Overall, the Mustang’s big change for 2015 is that all the engines are cool. 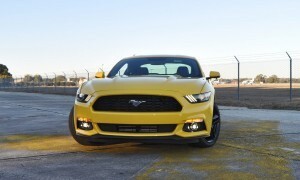 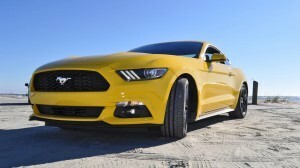 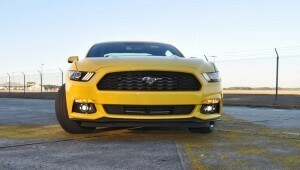 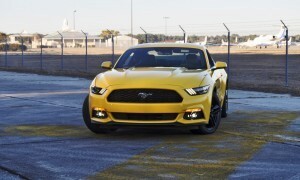 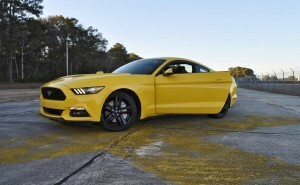 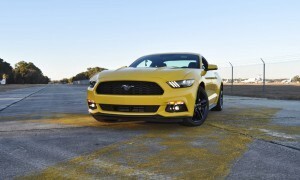 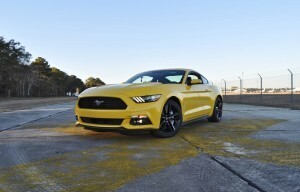 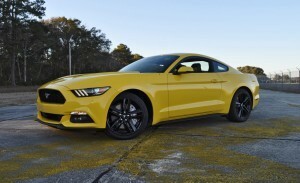 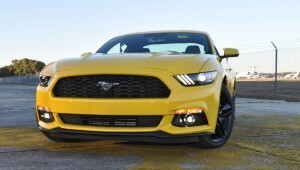 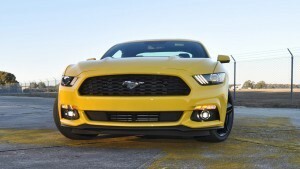 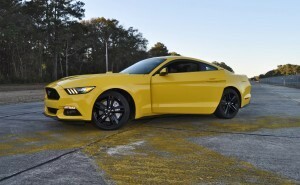 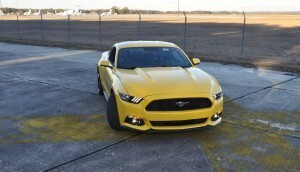 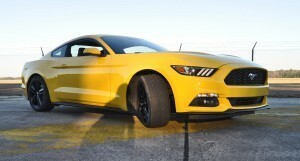 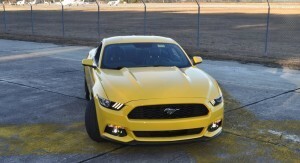 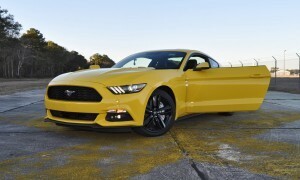 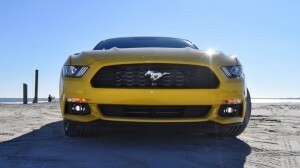 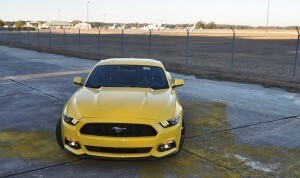 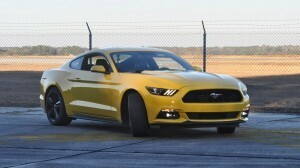 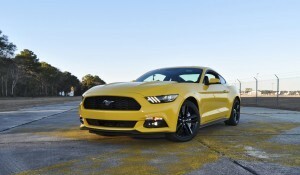 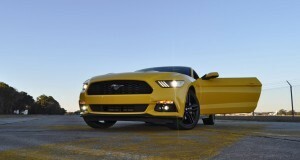 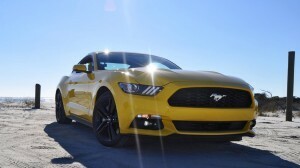 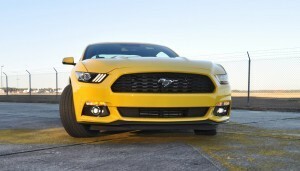 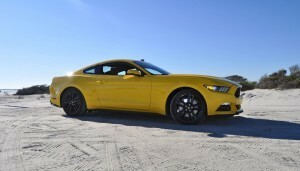 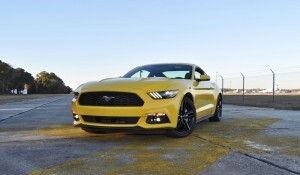 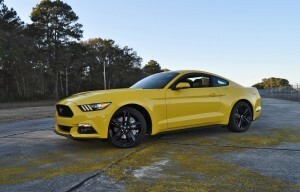 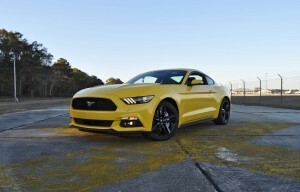 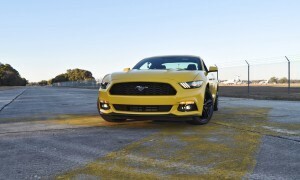 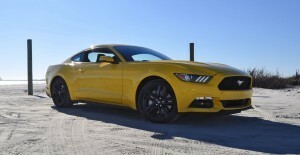 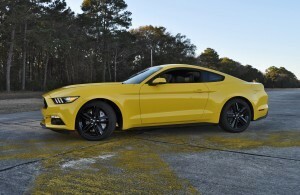 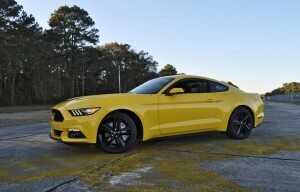 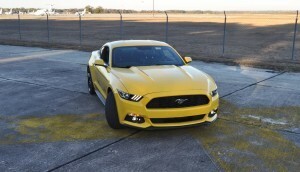 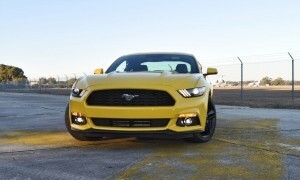 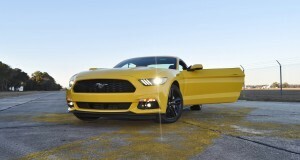 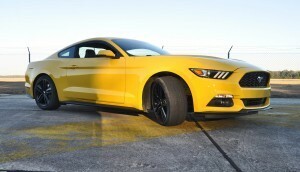 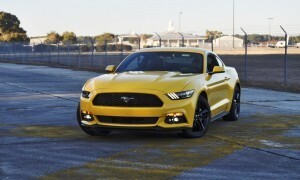 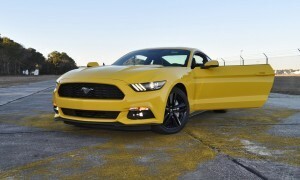 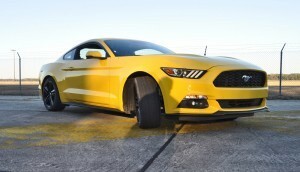 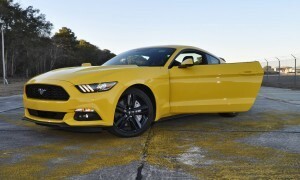 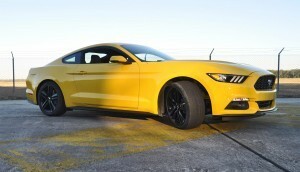 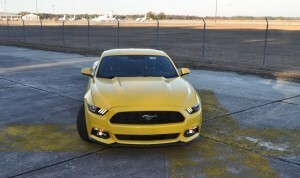 No more base Mustangs being scoffed-at for their three-spoke hubcabs. 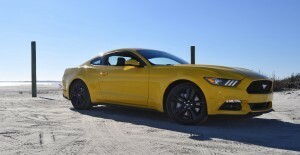 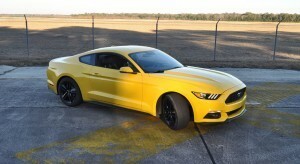 The cabin of the new Mustang EcoBoost also feels ‘just right’ from the first sitting. Excellent power-operated performance seats, a hugely adjustable steering column and the latest in active safety tech are all included on this loaded test car. 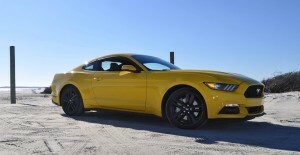 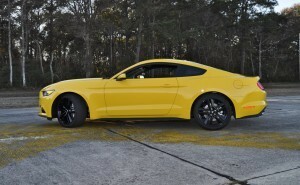 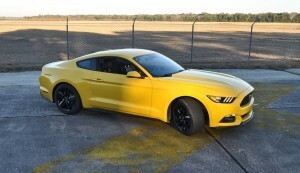 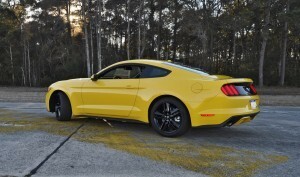 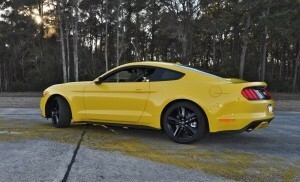 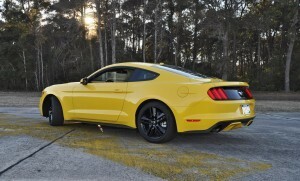 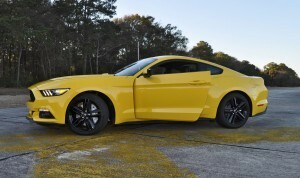 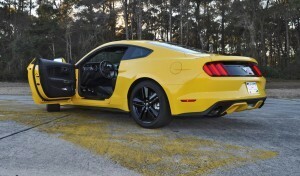 Upgrades over the already-swanky $29k 2015 Mustang Coupe Premium include about $3k in upgrades. Adaptive cruise and rear parking assist for $1500, security system and voice-activated navigation for another $1200 and the Premier trim group for $400. 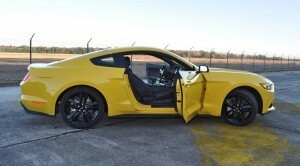 The result is like the perfect black leather jacket: comfortable, cool and seductive — with just a hint of danger. 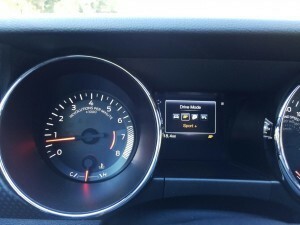 The machine-turned look of the dash panel is a nice treat, and the low roofline and black headline remind you and your passengers that this is a serious sports car. 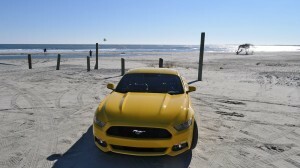 The visibility in the Mustang is far better than the Camaro coupe. 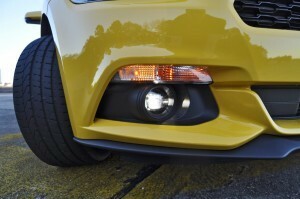 You can still see stoplights without leaning down and looking up, and the view from the side is broad too. 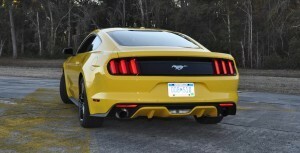 The rear three-quarter and backup views are far tighter and more limited — making those options above extra helpful in daily use. 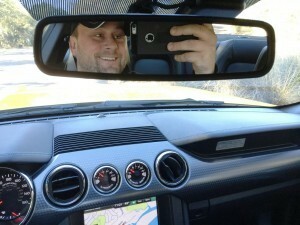 The black leather seats with heating and cooling are really stellar. 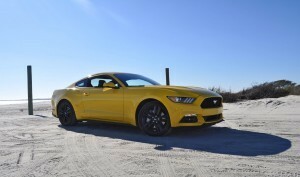 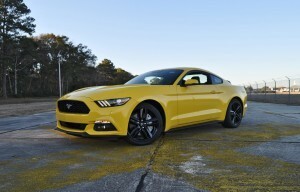 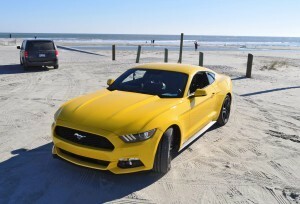 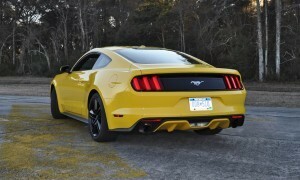 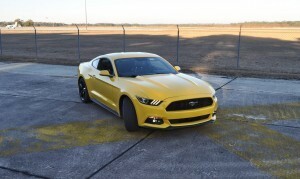 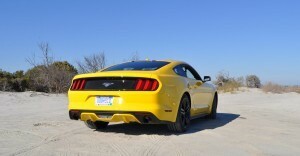 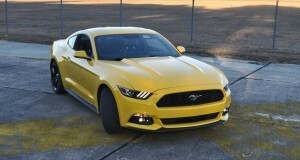 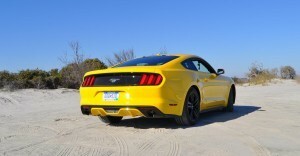 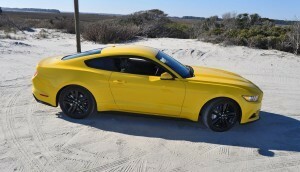 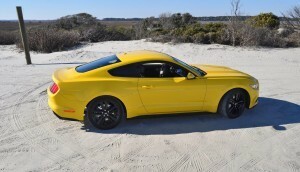 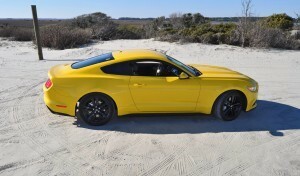 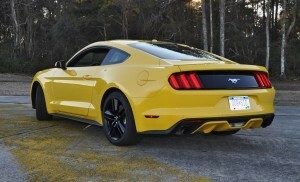 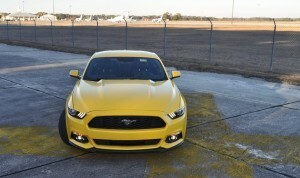 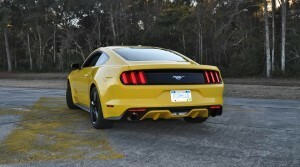 They make this Mustang feel like a competitor to the Cadillac ATS, Lexus RC350 and even the BMW 428i.